Workshops and Advanced Workshops are designed to improve your understanding of the Scheme and explain how to meet and exceed the expectations of the Code of Considerate Practice. Held across the UK and presented by experienced Monitors these events will help you attain the highest standards of considerate construction. It is advised that those who wish to attend a Workshop first complete the ‘Introduction to the Considerate Constructors Scheme’ e-learning on the Best Practice Hub. All e-learning courses are available free of charge for registered Hub users. Important notice: The information collected here will only be used to contact you relating to these events. Aimed at those who already have a good understanding of the Scheme and wish to advance their knowledge of considerate construction, the workshop explains how to perform beyond compliance using examples taken from the National Site Awards. I would just like to say how much I enjoyed the session and how informative I found it. I really felt enabled to get into the ‘mindset’ of the Considerate Constructors Scheme and this proved to be helpful for when we had the first visit from our Monitor. I would recommend it to our subcontractors so that they are aware of your requirements and it would help us on sites. Attending a Workshop costs £136 (+ VAT) per delegate and gains you 3 hours of CPD. Please see below for 2019 dates. The Advanced Workshop involves working through a group-based task guided by an experienced Scheme Monitor, based on a real-life scenario. You will learn how innovative ideas and practices are formulated and develop the skills and knowledge necessary to attain the very highest of considerate construction standards. Due to the complexity of the day, and the need for an advanced understanding of the Scheme, this event is only intended for Site Managers, Construction Managers, Project Managers, Project Directors and other senior managers who have significant experience of controlling construction sites. 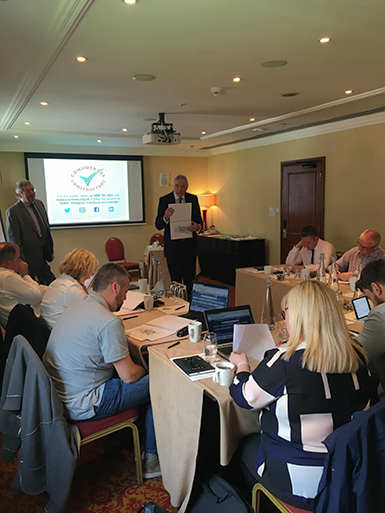 Delegates will normally have previously attended a Scheme workshop and will be able demonstrate considerable experience in working with the Considerate Constructors Scheme, normally evidenced through achievement of National Site Awards and regularly achieving a score of at least 41. To ensure all delegates get the best from the day, all applications will be reviewed to ensure suitability. It was a real pleasure to meet fellow industry professionals and to explore ideas for raising the bar even higher. The day led to healthy discussion and a bit of competition to generate ideas that we could deliver in our companies. Exploring the Best Practice Hub in a group setting was a valuable part of the day. Advanced Workshops are an all-day event (including lunch and refreshments) costing £336 (+ VAT) per delegate and will gain you 6 hours CPD. Please see below the 2019 dates. A Private Workshop is a 3 hour training session following the same format as our Scheme Workshops which can cater up to 20 people from your organisation. It looks at how to perform beyond the basic requirements and is hosted by one of our experienced and knowledgeable Scheme Monitors. It is a great opportunity to be able to tailor the delegates’ learning to your company’s needs. This event can take place either at your offices or a venue you may wish to book. The Scheme also offers Private Advanced Workshops for those who have significant experience of controlling construction sites, and a high level of knowledge about the Scheme. Price available on request.